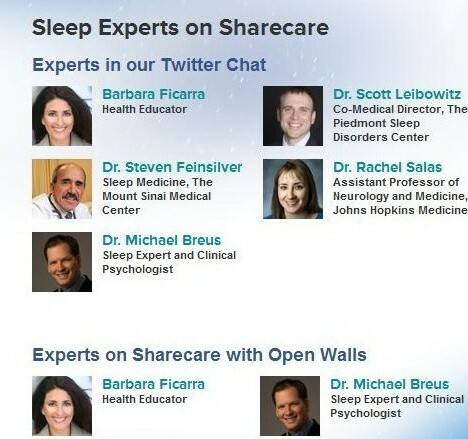 Sharecare’s recent Twitter chat engaged the community with information to help them learn about the importance of sleep. Sharecare’s sleep experts gathered online for a spirited conversation about sleep problems and solutions. During lunchtime on the east coast, and morning for those folks on the west, Sharecare’s community of tweeps gathered to engage in a chat about sleep using the hashtag #geturzzzs. For two hours a community gathered to learn from Sharecare’s experts. From learning about Shift Work Sleep Disorder (SWSD) to finding out how much sleep is enough to simple tips to help you sleep better, Sharecare’s sleep experts offered helpful information. And, while 140 characters isn’t much room for detailed information, some tweeps were sent a link where they can go for more information. So just how far did Sharecare’s Twitter chat reach? I would say the power of social media reaches far beyond tweeting which type of coffee you like at Starbucks. Social media is influencing the way in which consumers obtain and share health information. Twitter is a powerful platform to help educate consumers and raise awareness of health issues. Keep your eye out for the next twitter chat from Sharecare to help empower you. Sharecare created by Jeff Arnold, founder WebMD and Dr. Mehmet Oz, a leading cardiac surgeon, health expert and Emmy-award winning host of “The Dr. Oz show” is an interactive, social Q&A platform designed to greatly simplify the search for quality healthcare information and help consumers live their healthiest life. The platform allows people to ask, learn and act upon questions of health and wellness. Sharecare collectively brings together top leaders in the health care industry to provide consumers with multiple perspectives within a single website dedicated to improve health and wellness for healthier lives. Sharecare is in partnership with Harpo Studios, Sony Pictures Television and Discovery Communications. Have you participated in a Twitter chat? What was your experience like?